We have spent the last week in New York with the Italians and our East Coast family. It was so good to see familiar faces, tramp through the city and snuggle up with my in laws and tea. Now we are home and back to reality and I find that I can't stop thinking about a larger dining room table. I know, I know... But Husband's parents are coming to visit us in about three weeks and besides a ton of work, (more on that later), I find myself dreaming of this West Elm Industrial dining table. Just so we can all fit at the same table. I hope your week is starting off as dreamy as mine. I hope everyone had a beautiful weekend and hopefully a day off for President's Day. I had a fun day of thrifting and picked up a few goodies. I have been on the lookout for a small island for my kitchen (I know, I know. As always). We have our large wedding present island, but I wanted a little something to put in the middle of the kitchen... Just to make cooking easier and a place for centralized counter space. I found this great little gem at the Sunnyslope St. Vincent de Paul and fell in love. So much potential! I wasn't really loving the color and the wood stain. I wanted something rustic, and a bit more industrial looking, so I decided a makeover was in order! I started by sanding the whole piece. I decided against stripping the wood finish, but instead used a wood stain to darken and distress the color. I also used Rust Oleum's Hammered finish spray paint to give the island a 'metal' look. Then I replaced the knob and sprayed a few poly coats. ... and I have been snuggled up with the latest issue of my Country Living. I wanted to share some photos of interior designer Kendal Agins Friedman's home featured in the issue. She lives in a beautiful California ranch style home that she remodeled and turned into an open, spacious retreat. Go to Country Living and check out the photos. Or you can take a look here. Lovely, yes? Tonight I am dreaming about purchasing a new couch for our family room. Our two sofa's are just too bulky for this small room and I would love nothing more than finding an affordable chaise settee to relax and kick back. I felt like I hit the jackpot when I found this piece at the St. Vincent thrift store last month. This beautiful Thomasville vanity was sitting behind a stack of furniture, just waiting for me. I knew the moment I saw it, that this was going to be February’s item. To all you avid readers, it can be Yours FREE! 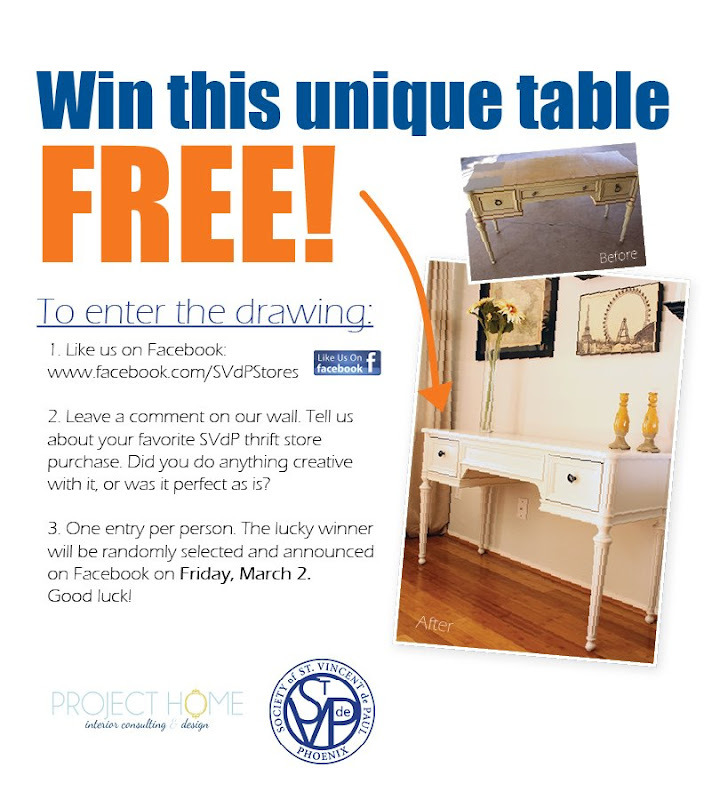 Just visit St. Vincent de Paul’s Facebook page and let them know about your favorite SVdP purchase. For one lucky winner, this great sideboard will be theirs to decorate their home with. I first started off by filling in the dented areas with wood filler. I removed the decorative front knobs, the remaining hardware, and the wood organizers that lined the top opening. I decided to remove the boards so that I could make room for one lined space. This just felt more open and made lining easier. I ended up removing the interior mirror. I don’t think you can see from the picture, but there was a crack in the corner and when I unscrewed the mirror, the whole thing cracked. Uh oh! Crumbling mirrors, not so fun! I used wood filler to cover the screw holes, sanded the entire piece and started painting. I chose a very light grey from Behr called Silver Drop, and added Floetrol to reduce brush strokes. After 24 hours I added four coats of poly to better protect the vanity.